GET OUT! I am floored. I don’t think I’ve ever been ranked #anything in the world. What’s even better is that I am in the company of many of my favorite food blogs. This is quite the honor. I was speechless for all of two minutes! So there is this rather long meme about marriage that Heather recently wrote up, and while I don’t know the woman (nor she me) I thought the questions would be fun to answer and perhaps a little informative – for me as well. Oh, and I tag every damn (in the good way, remember) one of you with a blog. Let’s get on it… there’s a recipe waiting. I asked Jeremy if he had anything going on Friday afternoon and he lied to me and said, no, he didn’t have anything going on, when in fact he had a math recitation, which he skipped – it was the only class he ever skipped. Seeing as my sister died 5 years ago, we see Jeremy’s brother more often. We’ve weathered graduate school, my sister’s death and all of the headache of the aftermath, and then my cancer – all with flying colors as far as being a couple goes. Basically, Jeremy is a treasure. Why yes. We both went to Caltech for our BS degrees (me: engineering and applied science, he: physics) and then we suffered Cornell for our PhDs (me: geophysics, he: astrophysics). This made my mother immensely happy. Nope. I’m from Williamsburg, Virginia and Jeremy hails from Albuquerque, New Mexico. That depends – Jeremy is infinitely smarter when it comes to abstract and advanced concepts. He is an academic super-star and he has an amazing breadth of knowledge spanning economics, the sciences, music, politics, medicine. The man used to be a navigator in Search and Rescue – we NEVER get lost (meaning, he never gets us lost). I’m more intuitive when it comes to physical/mechanical systems and practical design. I’m quicker, more creative, and less constrained by conventional thinking. Jeremy’s parents never criticize their children. My parents criticized us all the time (per the Chinese parent handbook) – I call it boot camp. Jeremy is very sensitive to criticism whereas I could care less. But I’m the one who bawled my eyes out when Sam carried Frodo up Mount Doom. That said, all of my girlfriends adore Jeremy as he is an astute observer and far more sensitive and caring than any heterosexual man. That would have to be Sushi Tora in Boulder. New Zealand – three times. And we’ll do it again. I have the dorkiest exes. Just two weeks ago I forced Jeremy to take me to his office so we could find the surface of his desk. Definitely Kaweah. How a 55 pound dog can shove two adults off a queen-size bed is beyond me, but she and her jiggy legs and bunny dreams manage it. Me. I hate to sleep and he loves to sleep. He tells our friends he hasn’t slept in for 16+ years. The Pasadena Bakery in Old Pasadena. Oh, the days of youth and hormones. Neither one of us has ever been jealous of other people… But Jeremy does get upset when I ignore him in favor of the dog or when I accidentally call him Kaweah. No time flat and it’s been that way ever since. Jeremy. I’d also like to point out that this amazing man cleans the bathrooms, vacuums, does the dishes, and fluffs my pillow every night. Jeremy is better at system administration, programming, computation, and hardware. I am better at web design, interfaces, graphics, satellite imagery, and parsing data from NASA. Jeremy drives unless he’s had a drink or we need to get someplace fast. I more or less followed a fusion of Susan’s recipe and several others from online sources and a soup and stews cookbook. Of course, I made this soup back in November and cannot remember what the heck I did. Thankfully, I am OCD enough that I jotted the notes down in one of five notebooks that document everything I do because I knew Future Me would be glad – and I am. You can make this process much easier by using beef broth and a leaner cut of meat, but I liked the sound of the roasting bones (something I had never tried before) and Kaweah quite liked the smell of roasting beef bones in the house. She kept strolling into the kitchen, raising her snout into the air with a casual wag of the tail. While the roasted bones were simmering in water for the broth, I prepped the rest of the ingredients. [I have a pound of crimini mushrooms listed in the recipe, but I forgot to buy them, so did without.] 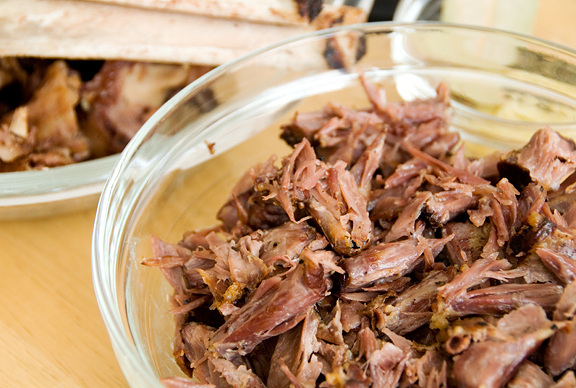 When the broth was ready, I stripped the beef from the bones and removed any excess fat. Kaweah used to chew on beef bones all the time until she shattered (we’re talking 14 fracture planes) one of her molars at the age of 2. Little Miss Power Chewer had her tooth removed and the Cornell veterinary dentist said no more beef bones for our gap-tooth hillbilly dawg. It was a sad day. Aside from making the broth, this pot of soup comes together rather quickly… and deliciously. If you like to de-fat your broth like I do, this nifty ziploc bag trick is a huge time saver. 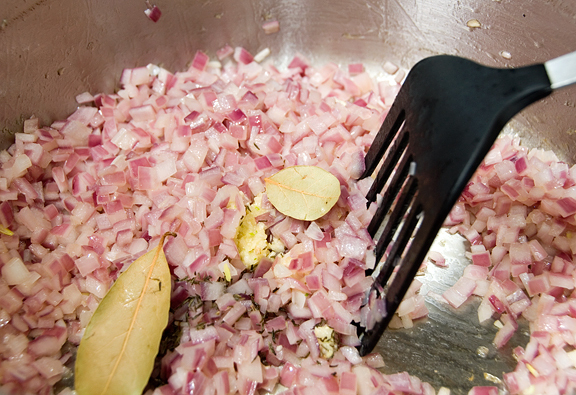 After sautéing the onions and seasonings, everything gets dumped into the pot and simmered until done. The whole ensemble is a satisfying bowl of homey flavors that play nicely together. 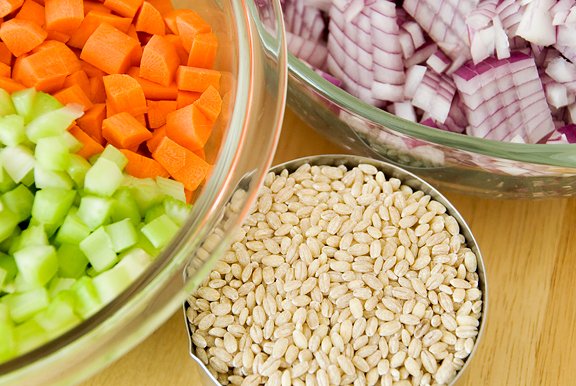 I love the chewy pop of barley in my soups. This recipe is the perfect après ski meal to curl up with in winter – and there is still plenty of winter to be had around here. I relish it. Preheat oven to 425°F. Rinse the beef bones and pat dry. 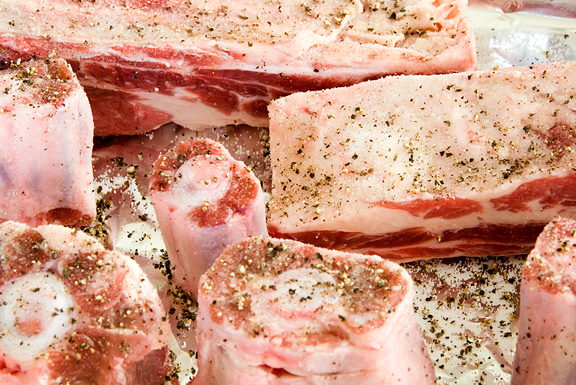 Season the beef bones with salt and pepper and roast them in a baking or roasting pan for 90 minutes. 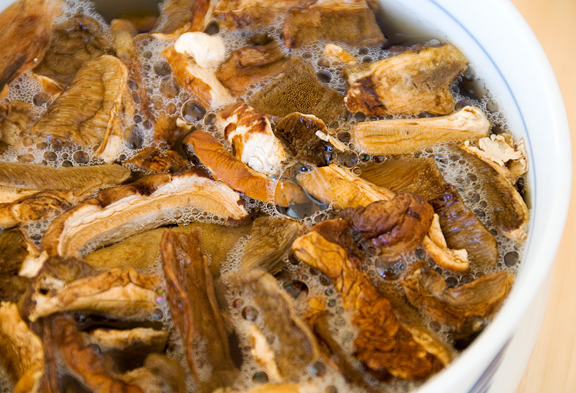 Soak the porcini mushrooms in boiling water. When the mushrooms are rehydrated, strain and reserve the liquid. Rinse the porcini mushrooms of any sand and grit and then chop them up. 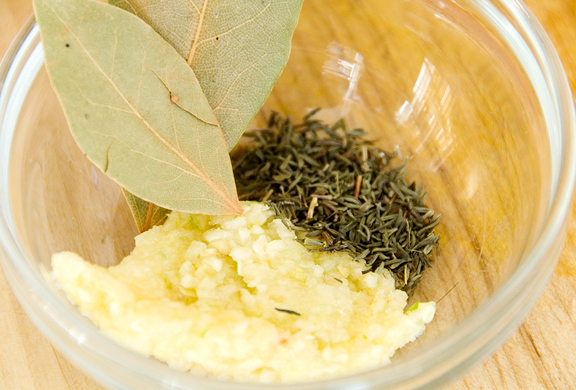 Mash a teaspoon of salt into the garlic to make a paste. Set aside. When the beef is done, remove the beef to a stock pot (including any fond from the baking pan) and cover with water (about 3-4 quarts). Bring the water to a boil and reduce to a simmer. Let simmer for 4 hours. 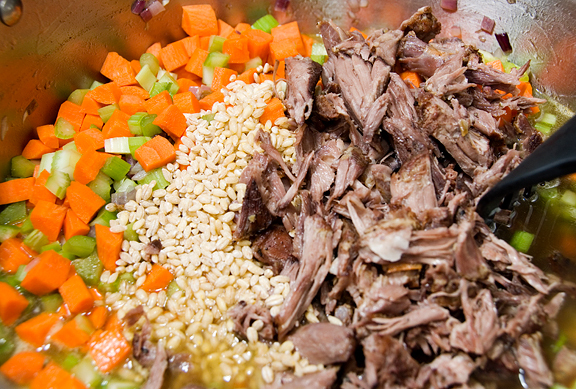 Remove the beef from the broth and strip the meat into a bowl. Discard the fat and bones. Strain the broth and then de-fat the broth. In the empty stock pot, sauté the onions in olive oil over high heat. When the onions soften, add the garlic paste and seasonings, stirring until fragrant. Then add the mushrooms (both kinds, or just the porcinis if you forgot to buy criminis like me), carrots, celery, barley, beef, broth, porcini liquid, and lemon juice. Bring the contents to a boil then reduce to simmer until the barley is tender to the bite. Serve hot. Congratulations! I’ve been a VERY regular visitor of your blog, so great to see it finally being recognized! I love the pictures, recipes and Kaweah but what I really love the most is that you don’t take crap. From anyone. I love that. I adore your blog and your spot on that list is definitely well-deserved! You are awesome. 39 is grotesquely underestimated though. They must be still compiling their “Platinum list of excellence and distinction”, because I’m not on this one. Jennifer: I am a Swedish fan of Use Real Butter and in my humble opinion #39 is too low. Your blog is one of the best. It is not only filled with delicious recipies, but it also has your fantastic photography and that taken together make this one of the most inspiring food blogs around. Keep up the good work! Completely deserved honour Jen! Love your site and particularly the new recipe index. You’re now bookmarked as a place I can come to find recipes that will work. Looking forward to making the Knorr spinach dip this week for book club. I cant believe Kaweah shattered her tooth! I let our dog, Suki, chew on big marrow bones all the time. I’m going to watch her close the next time I give her one. Soup looks delish, and I love your answers to the marriage questions. I hope my marriage is just as wonderful when we’ve been together as long as you guys! I’ll be right over for a bowl of that soup! Loved your meme replies. Too fun! It’s always nice hearing little details of folks lives. Can I borrow Jeremy for awhile? I need help with my spring cleaning and a lesson in fireballs over Texas. I was prepped and ready to write nasties if I didn’t see your blog. You are amongst the finest. I celebrate all of you!! Personally, I think you should be a lot higher on the best 50 list! Congratulations, and thanks for the delicious soup recipe – your intructional photos are the best! Kudos and congratulations to you; so very deserved and it is lovely to see you getting the recognition. Cheers! congrats!!! I came to your blog following a link on Tartlette and have loved since. Congrats on the well deserved recognition. (can’t do the tag as I’m a single). Congratulations! Yours is the first blog I visit when I see a new post on my reader. Thanks for sharing, you and Jeremy are an awesome couple, sounds like you’ve really got a good partnership. KUDOS and CONGRATULATIONS to you! Now don’t go gettin’ all hoity-toity on us, ya hear!!!! I thoroughly enjoyed reading your answers to the meme. You two have such an enviable relationship. So nice. “when in fact he had a math recitation, which he skipped – it was the only class he ever skipped.” That is the most endearing thing I’ve ever read. Haha, very cute. The soup looks abso-freakin-lutely delish too. I love what you say about you and Jeremy, and HOW you say it. I also love your photography for your food blog. I must tell you I have a very thoughtful hubby who cleans the house and fluffs my pillows everynight. Isn’t it great to live with a gem of a man?!!! Congrats for making it to the top 50! You deserve it completely! That hearty soup looks mighty delicious! A tasty recipe! Congrats! I love reading your blog and seeing all the wonderful recipes you come up with! Congratulations! I agree with everyone here–you truly deserve the recognition. your blog is definitely one of my top 10s … i check it -dare i say- religiously while in the lab and at home. i love the recipes and i stay for the stories and the photos (which are breathtaking btw). i am so making that panna cotta you posted earlier ! CONGRATS! You deserve it – we LOVE your site! There is so much heart & love right here. 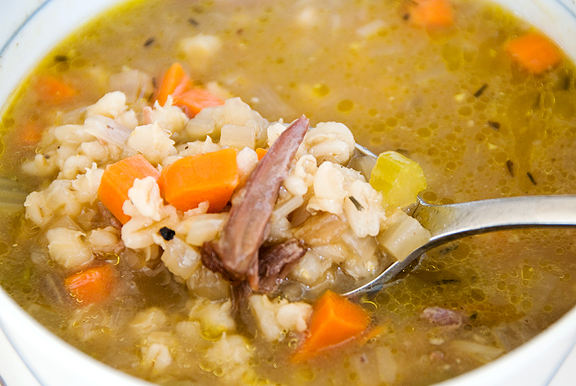 The beef barley soup sounds great, too!!! The soup looks amzingly good. Jen, I only recently discovered your site and have to say I come here often for your optimisim and humor as well as my food fixes for the day. Congratulations on your being picked for being one of the best, it’s great. Congratulations! I’m not surprised one bit! You two are just so perfect for each other – I loved reading your answers! Ah wait, I’m guessing your middle name is…Shih? well done, you absolutely deserve it. i have been reading your blog for a while now and do not tire of the beautiful pictures, your stories and the lovely recipes… keep up the great work! i come to see your blog every other day, and most of the time, there’s new ones waiting for me to enjoy. I love it! forget those top 50’s..who cares……….you are the best~~!! Old Town Bakery! Ah, those were the days. It’s now some awful Italian/California Fusion restaurant that has a DJ spinning records after 9:30 PM, like most of the restaurants on Colorado. Sad, isn’t it? Pasadena used to be so lovely and now it’s a wasteland of Cheesecake Factory and bar/nightclubs that no one I know would be caught dead in! The soup looks deeeeeelish, and I really enjoyed reading this meme. Thanks. WOW! Congratulations! I am so happy for you! My friend is famous! My friend is famous! And your meme is adorable. It really makes me laugh because it’s almost exactly the opposite of what mine would say…..
1) Congratulations! I am not in the last surprised, but am ecstatic to see you getting the recognition you heartily deserve. I love your photography, am stunned by your baking prowess & mise-en-place skills (yeah, it’s a skill… one I don’t have. I’m a very, very messy cook), and always leave your posts hungry. 2) You and Jeremy are adorable. I love geeky guys, and I married one, an electrical engineer, so I know the benefits thereof firsthand. Well, yeah…I’m new to all this food blogging, however, you should be in the top ten my dear. But what do I know? Keep on keepin’ on stranger friend…..you can even make beef barely soup look yummy! I adore soup and that is awesome! Yum! I’m sad for K girl tho… no bones? K boy lurves his and we’d all be bummed if he couldn’t any more. I worry about his teeth sometimes too, and now I know it’s not without cause! I am so making this soup. mmmmm and it gives me another chance to use the ziplock trick! I love that… so simple and yet so perfect. Hey you deserve the acknowledgement! You write great posts, have incredible food and amazing talent. I think I will do that meme. There hasnt been many lately, so it will be fun. I’m so flattered that you liked my soup enough to try it. I love your tweaks! I’m definitely adding the mushrooms and lemon juice next time. 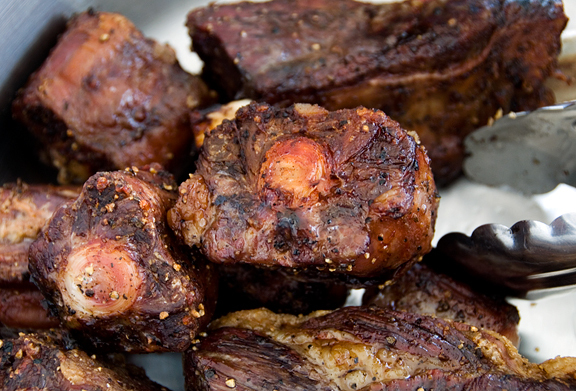 If you wanna still treat Kaweah to a FABULOUSLY, FANTASTICAL treat – go for pork bones. They’re way softer. I freeze 2-3 cut up pork neck bones (raw; then frozen) and Lucca has herself one very special dinner! Unless Kaweah’s teeth are especially compromised now – either due to age or her 2 year-old incident – I’d imagine they’d be perfectly fine and she would LUV them. Happy height of the ski season. And congrats again! Congrats Jen!!! I find it awesome that you rank amongst the best in the WORLD!!! Make us proud. Oh yeah, and very cute meme…you and Jeremy are like the Lego pieces that fit together. Well done on making the Times list. Very deserved. Interesting meme too. Congratulations! How wonderful. I hope you continue blogging for a very long time. first of all, congrats to you on that top 50 of the world! well done girlie! and those braised oxtails… almost fell off my chair. look at that caramelization! you’d make all my culinary school instructors happy! Whoa, indeed! That you did a meme :-D That URB is in the top 50 is not a surprise. It would have been if it wasn’t included. It should be in the top 10. I love the chewiness of barley. I pressure cook the heck out of it though when I make a mooshed up stew called haleem – a special dish made to celebrate the end of the Ramadan fast. HmmmMMM, this is perfect for having on a chilly night! Snuggled up at our ‘cosy corner’, watching a DVD with a soup bowl in each pair of our hands. And hey Jen! I’m not surprised! Your blog is THAT GOOD! You sure deserve to be UP THERE in the top 50! Cheers! This marriage meme is cute! Like you, my temper is the worse one in the marriage. Sigh! *I* find the surface of my husband’s home office desk but he loses it in a minute. Actually, what’s more urgent now is to find a square feet of the floor to stand on!!! Argh! Catherine – thank you, you’re very sweet. Paola – your English is delightful and you are so sweet for commenting. Thank you. Graeme – oh hon, you are biased! Yes, I think they are saving the best for last and that means you will be reserved for that list. Now post some food for us! Martin – I am so flattered! Thank you for such a kind comment. Readers like you make it all worthwhile. Kelly – thank you. I hope you like the dip – it’s always a hit! Margie – cool, I love fireballs. But, I’ve only seen one or two in my life. Thanks! Dragana – oh, you guys are all so biased! But thanks, it’s means a lot that so many loyal readers are rooting for urb! Tara – you’re sweet – thank you. JessW – oh no, thank YOU for reading. It’s the community that makes it so much fun. Charlane – Tartelette, my home girl :) Obviously you had great taste from the get go! Jennywenny – you are such a dear. Thank you. Lezel – ha ha, I wouldn’t know HOW! hee hee. Mary – it’s so geeky, no? :) thanks! The soup was happy-making to be sure. Kathy O – oh yes! Homemade soup is so awesome when it’s snowing out!! Laura – ha ha, glad that our geeky history can be endearing too! Jamie – woo! thanks and I hope you love that panna cotta! Laura – wow, you really flatter me! Thank you. Jeanne – thanks so much. PE – ohhh, you’ll have to take that up with the Times ;) I’m just ecstatic to be in the top #50!! Johanna – that is very kind of you, thank you! Jie – thank you, you are so sweet. Anne – oh, that’s too bad :( I loved their brioche. Pasadena definitely evolved quite a bit… Thanks! Julia – awww, thank you! Rita – that’s very nice of you! Lori – cool! It’s fun to get to know other bloggers :) and thanks! Lisa – you’re funny ;) No idea where the blog will be, but I always hope you’ll be along (to tell me where to eat when I’m in the bay area too!!) I’ll try pork sometime. Problem with ‘weah is that she makes a MESS when she eats just about anything. Ugh. Can you see a diff in the PJ on the flash? Glad you like it. Take more pics of that pretty girl of yours. Thanks! Lily – awww, you’re very kind. I like the lego analogy b/c we both love legos! Kat – thank you. I hope so too! Can a person run out of recipes?! Adrienne – yes, the pup does get lots of attention :) She can’t help it, she’s a dog! ha ha. That beef and barley soup looks really good! SQUOZEN??? Love the recipe, though. Babs – yup – a word that gets a decent amount of rotation around here. I had a lot of fun reading the meme. and it is so lucky of you both. congratulations!